The Tax Cuts and Jobs Act (TCJA) made significant changes to the basic standard deduction, personal/dependency exemption deductions and the child tax credit. These deduction amounts will be adjusted annually for inflation. The standard deduction amount for an individual filing as a dependent of another, as well as the additional standard deduction amounts for the aged (65 or older) and/or blind remain unchanged. The deduction for personal and dependency exemptions is no longer available. 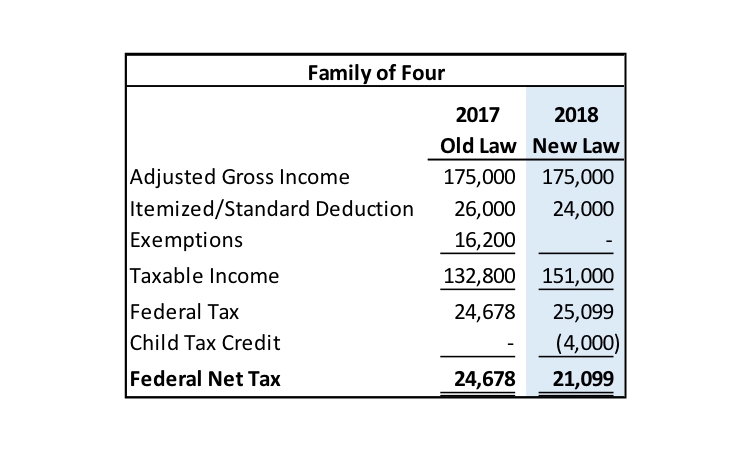 Under old law (using 2017 figures and assuming no phaseout), a family of four would have received a total personal/dependency exemption deduction of $16,200 ($4,050 x 4). For tax years 2018 - 2025, these exemption deductions are eliminated. Indiana will continue to allow personal and dependency exemption deductions. The child tax credit increases to $2,000 per qualifying child (dependent child under age 17). The maximum refundable portion is increased to $1,400 per child. In addition, taxpayers may claim a $500 credit for each dependent who is not a qualifying child for purposes of the child tax credit. No portion of this credit may be refunded. The modified adjusted gross income threshold at which these credits can be fully claimed increases to $400,000 for married taxpayers filing a joint return and $200,000 for all other filers. These income thresholds will not be indexed for inflation. The changes to the child tax credit are effective for tax years 2018 - 2025. Let’s take a look at two examples that illustrate the tax law changes discussed thus far. In our first example we’ll assume a married couple filing jointly with combined wage income of $175,000 and two dependent kids under age 17. We’ll also assume the couple claimed itemized deductions totaling $26,000 in 2017 of which state and local taxes amounted to $13,000. Under new law, the couple’s standard deduction now exceeds their itemized deductions due to the $10,000 cap on state and local taxes. The couple also loses personal/dependency exemption deductions totaling $16,200. However, the couple is now eligible to claim the child tax credit whereas under old law their income was too high. As you can see below, the loss of itemized deductions and personal/dependency exemptions is more than offset by the increased child tax credit and overall reduction in tax rates. This family of four will see a reduction in net federal tax under the new law. Please click here to review an example of the tax law changes as a family of four. In our next example, let’s assume a retired married couple (both age 65) filing jointly with combined taxable social security and retirement plan income of $80,000. Further, let’s assume the couple usually itemizes their deductions which total approximately $26,000. Under this scenario, the couple will owe slightly more tax under the new law. The couple will receive only a small benefit from the increased standard deduction, but will lose $8,100 in personal exemption deductions. 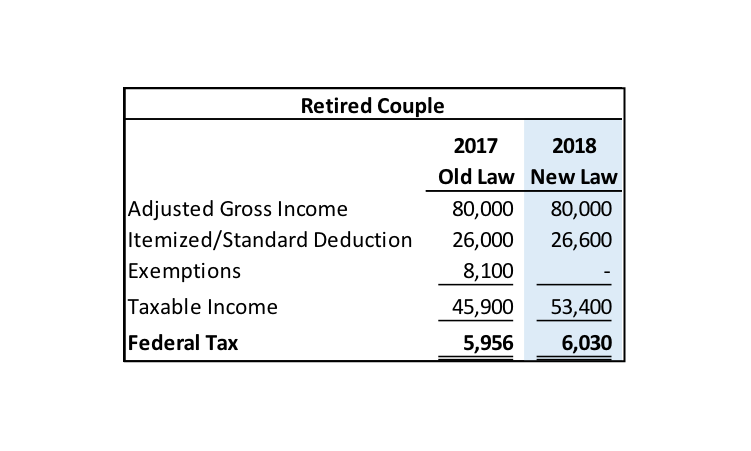 Please click here to review an example of the tax law changes as a retired couple. In general, most individuals will see an overall decrease in their net federal tax under the new rules. However, as seen in our second example, there are situations where taxes could be higher under the new law. Every individual’s tax situation is different, so give BMM a call for a personalized tax review.